Permission Push allows you to quickly update and override permissions for content, schedulers and more. Please use with extreme caution. Please note: Use this tool with EXTREME caution, as this will replace existing permissions on various objects (pages, portals, schedulers, and more) with the new permissions. We also recommend talking this over with your team before implementing, so everyone is aware of permission updates/access. 1. Anyone - This is literally everyone in your CRM. Use with caution, as you might end up providing access to content/features that the general public/your contacts should not have access to. 2. Active Members - If you utilize PeopleVine Membership Programs, in most cases active members of your Membership Programs can be provided with "special" access to certain pages/portal/content and other features like being able to book a time slot for resources, conference rooms and more. If you selected option #2 (Active Members) above, you can search for the Membership Program by it's name. If you are unsure of the name, you can access all of your membership programs here. 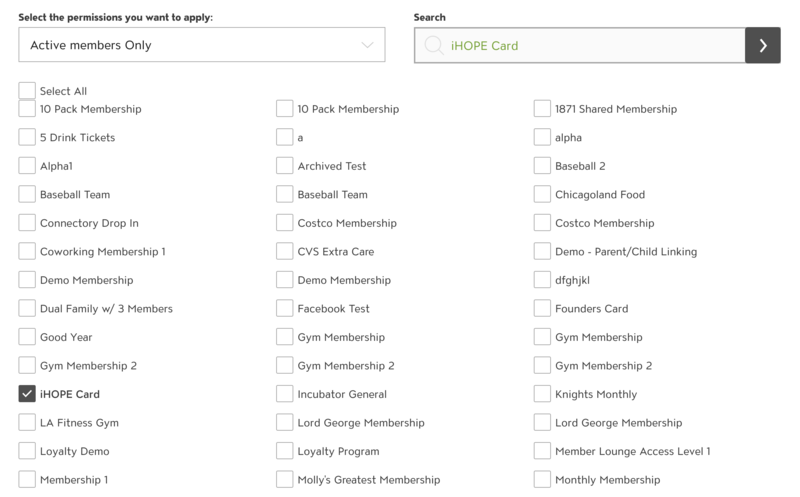 The next section will allow you to choose what "iHOPE Card" Active Members will have access to. If we select "Appointment Schedulers" and hit the ">" search icon, it will showcase all of the enabled schedulers and you'll see in the image below that we have chosen to allow "iHOPE Card" Active Members with access to booking Photography Sessions and Math Tutoring. Scroll back up to review all of the settings you have selected, once you approve, scroll down to and select "Apply Permissions". The settings will then go into effect immediately. In the image below, you'll notice we went to our "Math Tutoring" scheduler to check the settings and it now shows 'iHOPE Card" Active Members have access to that specific scheduler. "iHOPE Card" can be unchecked and the settings can be updated to remove that membership program from accessing if need be. These same settings apply to content pages, portals and more.